Olive oil is not what you think it is. According to Tom Mueller, author of Extra Virginity: The Sublime and Scandalous World of Olive Oil, an olive is a stone fruit like a plum or cherry—meaning that the green-gold liquid we extract from it “is, quite literally, fruit juice.” And, while we’re blowing your minds, have you ever stopped to wonder what “Extra Virgin” means? “It’s like extra dead or semi-pregnant,” Mueller said. “I mean, it doesn’t make any sense at all.” This episode we visit two groves—one in the Old World, one in the New—to get to the bottom of olive oil’s many mysteries. Listen in this episode as we find out why the ancient Romans rubbed it all over their bodies, and whether the olive oil on our kitchen counters really is what it says on the label. Olive oil’s original home lies along the shores of the Mediterranean, where its wild ancestor, the oleaster, can still be found today. Somehow, people realized that the bitter berry from these hardy trees tasted excellent when brined in salt and, even better, could be crushed to produce a liquid fat that was not only delicious but, Mueller says, burns as hot as benzene and has twice the caloric content of carbon. By the seventh century BCE, olive oil production was taking place at industrial scale: olive presses excavated at Ekron, in modern-day Israel, were capable of producing 500,000 liters of oil a year. The demand was equally enormous: olive oil powered lamps and preserved and enhanced food, and it was used an all-purpose medicine, a contraceptive—even an aphrodisiac. Olive oil was so critical to Greek and Roman culture that wars were fought over it and fortunes made, much like the petroleum sheikhs of today. Olive trees at the Castello del Trebbio in Tuscany; olive oils (Frantoio single varietal, the Castello del Trebbio blend, and the Castello del Trebbio blend gone rancid) laid out for tasting in the castle courtyard. Photos by Nicola Twilley. Today, olive oil is more popular in the kitchen than in a lamp, but it still enjoys a superior status to its fellow fats—particularly since the 1980s, when it began began to be promoted by medical researchers as a key component of the heart-healthy Mediterranean Diet. But all is not well in the olive groves. In Italy, millions of olives have already been killed by Xylella fastidiosa, an insect-borne pathogen that was detected in 2013. The disease can cause mature trees to die of thirst within two years. 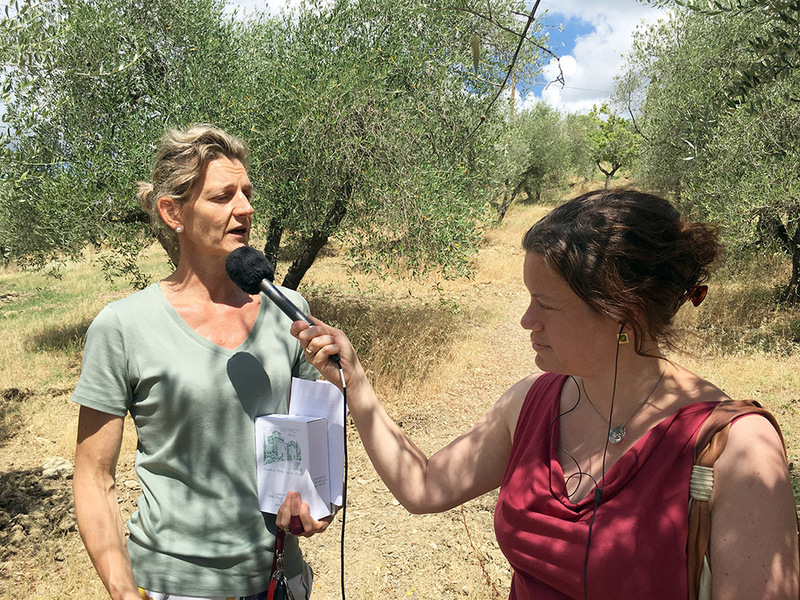 We speak to Rodrigo Almeida, a professor of environmental science at the University of California, Berkeley, to find out how worried we should be about the future of Italian olive oil. Meanwhile, olive oil fraud is rampant in general, but especially in the U.S., as profits from fraudulent oil can be more lucrative than dealing cocaine. Kathryn and Robin watching their olives in the malaxer; first oil from the centrifuge. Photo by Nicola Twilley. But fear not: we won’t leave you on this depressing note. Instead, olive oil growers Anna Casedei of the Castello del Trebbio in Tuscany, and Kathryn Tomajan and Robin Sloan of Fat Gold in Sunol, California, lead us through harvesting, milling, and, most importantly, tasting, in order to equip us to buy, use, and love olive oil nearly as much as they do. Listen in now, and then enjoy a big glug of oil over your veggies—heck, we won’t judge if you want to rub it on your skin, too! We need your help! We need to grow to make Gastropod financially sustainable, and we know from our recent survey that 20 percent of you found us from a friend. So … be that friend! Here’s our plan: podcasting’s very first Shareathon. Get five friends to subscribe, email us their names (just first name is fine), and get your hands on some awesome new and exclusive rewards. Here’s a page explaining exactly how it works (it’s not complicated, but just in case). If 1000 of you participate, we’ll even make a special Gastropod outtakes mp3, just for you. So what are you waiting for? Get out there and start sharing and winning today! 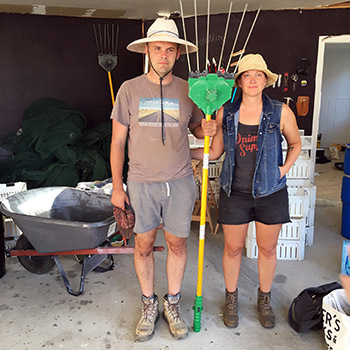 Olive Gothic: Robin and Kathryn pose with the vibrating rakes. Photo by Nicola Twilley. Kathryn Tomajan is an award-winning olive oil taster, miller, and consultant; her partner Robin Sloan is a novelist. Together, they decided to lease a small grove in California’s East Bay and make olive oil. 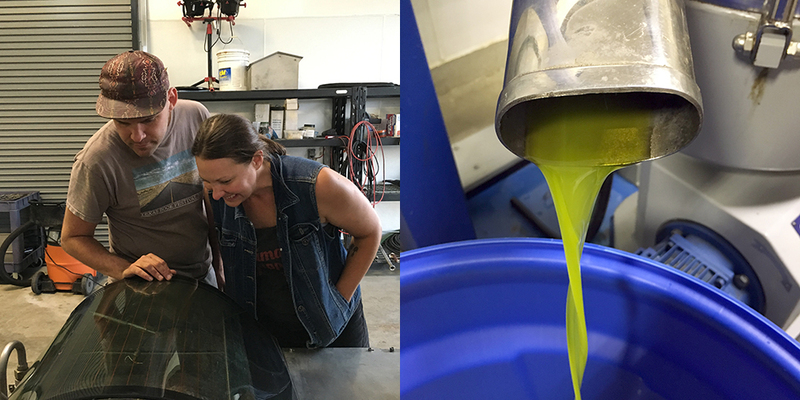 This year is their very first harvest, and they are making their single-varietal oil available by subscription: get yours, and read about their adventures, here. Anna Casadei oversees roughly ten thousand olive trees at the Castello del Trebbio, her family estate in the hills outside Florence. In addition to growing olives and making oil, she serves on the Florence Chamber of Commerce as an official extra virgin olive oil taster. In case you happen to be traveling in the area, they do offer tours, as well as apartments for farm stays! Cynthia taping Anna in the olive grove at the Castello del Trebbio. Toni Mazzaglia is the best. If you’re planning a trip to Italy, you need to take one of her amazing Taste Florence food tours. And, if you’re a journalist looking to report a story in Italy, Toni has seeming magical powers to make things work: you can reach her here. We can’t recommend her highly enough! Tom Mueller is a freelance writer whose book, Extra Virginity, is a New York Times best-selling account of olive oil culture, history, and crime. Rodrigo Almeida is a professor of environmental science at the University of California, Berkeley, much of whose work focuses on Xylella fastidiosa. In 2010, UC Davis published this report into olive oil authenticity. Among their findings: sixty-nine percent of the extra virgin olive oil for sale on California supermarket shelves was not authentic. 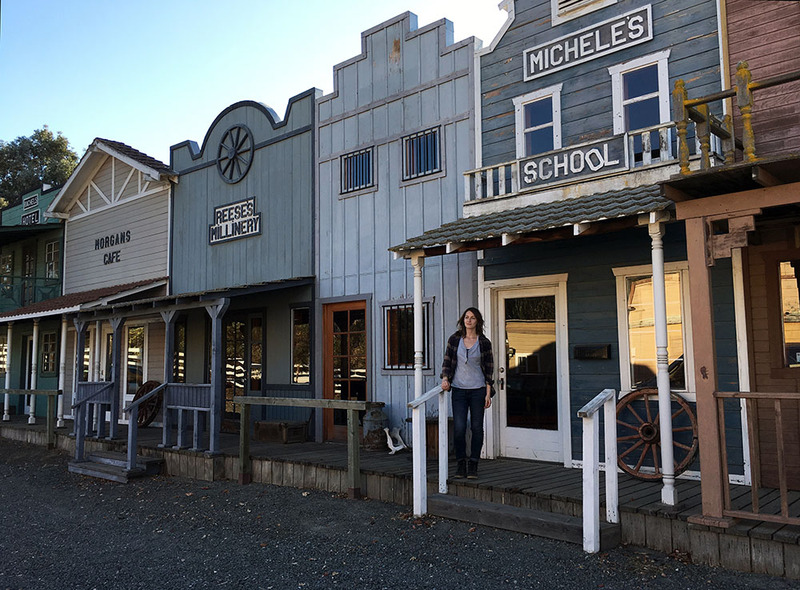 The barns on the ranch where Fat Gold’s grove lies are designed to look like a Wild West town. Listener Sarah Sclarsic provides scale. Photo by Nicola Twilley. 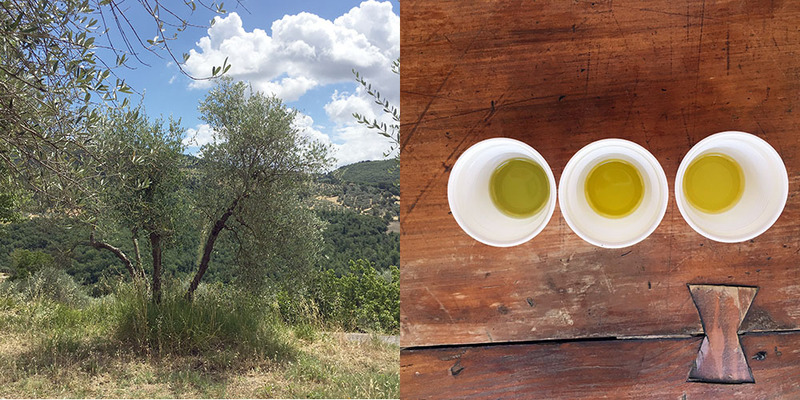 The post Green Gold: Our Love Affair with Olive Oil appeared first on Gastropod.